Goddess Saraswati puja will be performed on one of the day of Navaratri. The day when there is Moola nakshatram will be observed as the day for Goddess Saraswati puja. This year Goddess Saraswati puja will be conducted on Monday, 16th October 2045. Based on the region worshipping of Goddess Saraswati will differ. The following are some of the examples of worshipping Goddess Saraswati in different regions. In Tamilnadu Goddess Saraswati puja is performed on Ayudha Puja day. 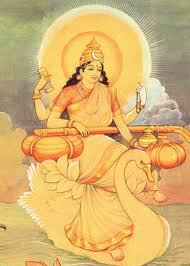 In Andhra Pradesh Goddess Saraswati puja will be performed on the day of Moola nakshatram. Maha Saptami is the day for Avahana of Goddess Saraswati. Durga Ashtami is the day for Main Puja of Goddess Saraswati. Maha Navami is the day for Uttara Puja of Goddess Saraswati. Vijayadasami Visarjan is the day for of Goddess Saraswati.